Hole number 9 is a par 3 of 128 metres. It is stroke hole 15 for men and 17 for women. 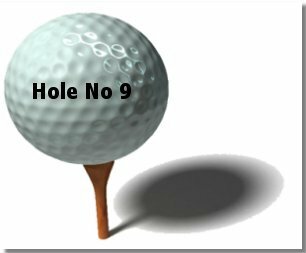 From the No 9 tee, players generally use a medium iron to hit towards the green with an emphasis on aiming to the area right of the green consisting of two mounds. The green has quite a severe slope to the left and in dry conditions, the ball can easily run off.